Prior to 1965 a thriving Bracero Program was in place in which roughly 450,000 persons entered the U.S. from Mexico each year on temporary work visas. These workers returned to Mexico regularly rather than staying in the U.S., thereby creating a circular flow of legal Mexican migrants. The program had a lot of problems, however, so immigration reformers with a civil rights agenda successfully shut it down. But while the program ended in 1965, the business need for this type of labor did not. 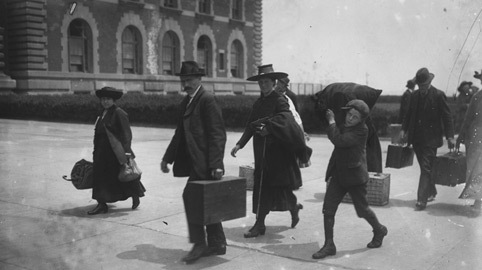 The result was that Mexican workers continued to enter the country, although now without documentation. Also in 1965, quantitative limits on immigration from the Western Hemisphere were established. Thus illegal immigration rose after 1965 not because there was a surge in Mexican migration, but because these immigration reforms rebranded legal migrants as undocumented workers and capped the number who could try to enter the country legally. 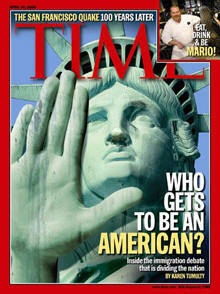 ”] No longer legal guest workers but illegal immigrants, the number apprehended at the U.S.-Mexican borderincreased. 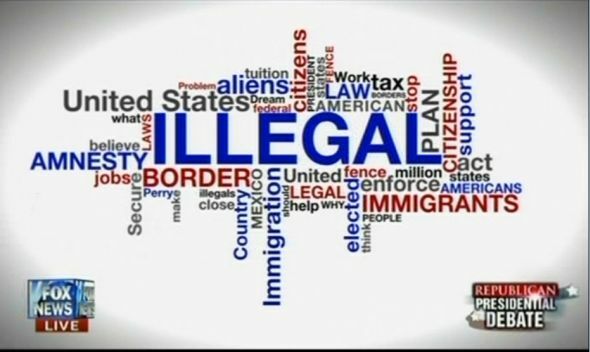 This allowed a new narrative to develop: illegal immigration was a crisis and new policies were desperately needed to stem the flow of the “alien invasion.” The more this narrative was repeated by politicians, the more the populace supported increasingly stringent immigration and enforcement policies, setting off a chain reaction: increased apprehensions led to increased calls and better tools for enforcement; increased enforcement led to more apprehensions; and increased apprehensions solidified in the public’s mind that illegal immigration was a growing problem that needed drastic reform. Moreover, increased enforcement did not really deter people from entering the U.S. from Mexico, but it certainly encouraged them to stay; the conversion from legal migrant to illegal immigrant was complete. 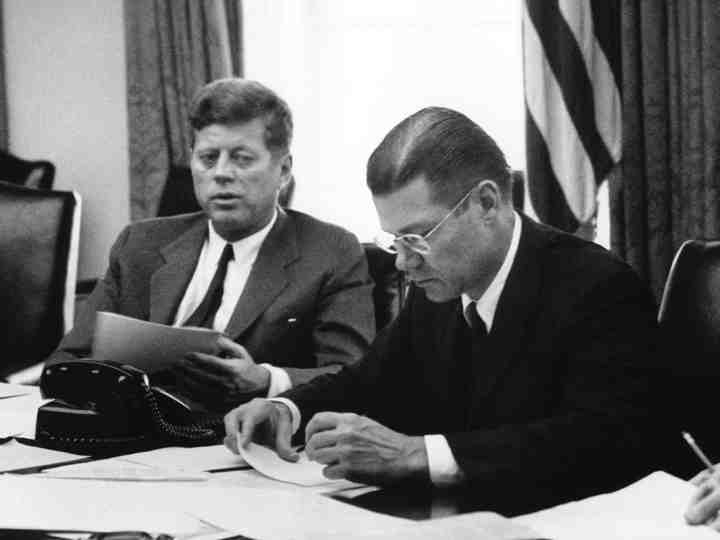 President Kennedy and Secretary of Defense McNamara in an EXCOMM meeting, October 1962. Second, the U.S. was involved in several Central American countries during the Cold War, which lead to further destabilization in the region and large scale migration north. While Nicaraguan émigrés were welcome as refugees (since the U.S. disagreed with the leftist government they were fleeing), others from Salvador, Guatemala, and Honduras encountered the same restrictions for legal entry as Mexicans. After the 1990s, the threat of terrorism intensified border enforcement and brought about a sharp rise in deportations from the U.S. Deportations replaced border apprehensions as “proof” that a Latino threat loomed. 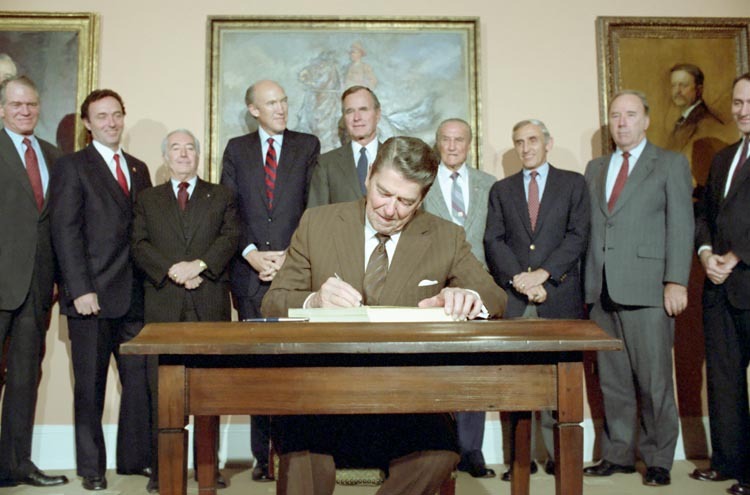 November 6, 1986: President Reagan in the Roosevelt Room signing S. 1200 Immigration Reform and Control Act of 1986 with Dan Lungren Strom Thurmond George Bush Romano Mazzoli and Alan Simpson looking on. Third, Latin American legal immigration – led by Mexico—was also on the rise after 1965, and particularly after 1986. Again, this was not a result of a conscious policy effort, but rather an unintended consequence of the various immigration reforms. Due to concerns about terrorism and a growing xenophobia, Congress began in the 1980s to strip civil, social, and economic rights away from legal immigrants. 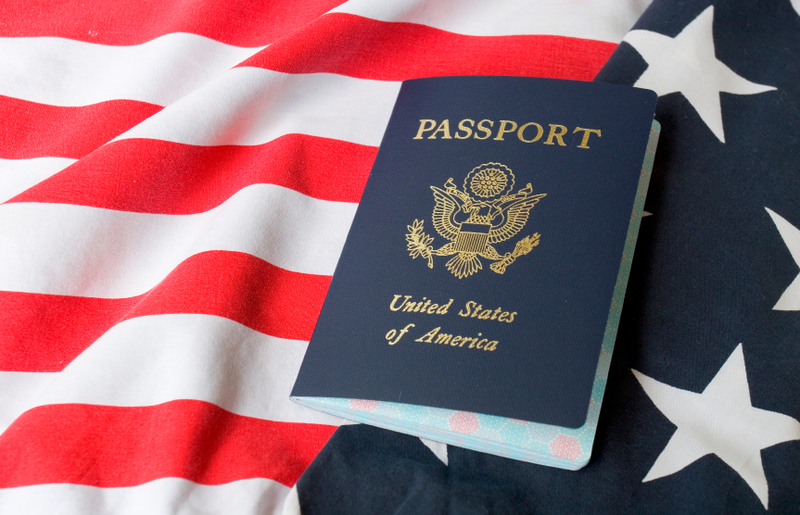 As it became increasingly problematic to be in the U.S. but not a citizen, the numbers seeking to naturalize increased. 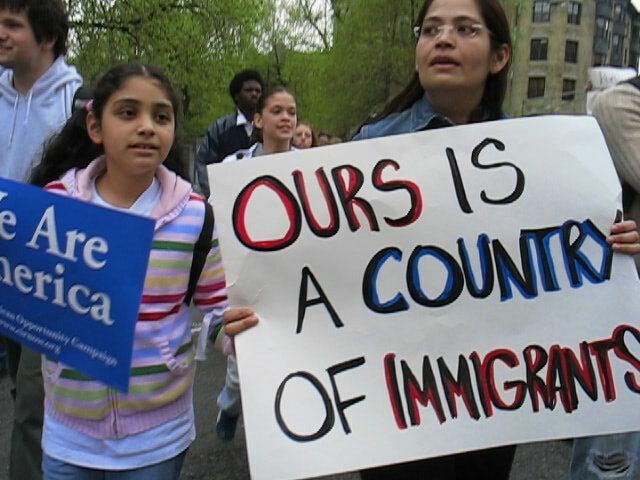 This happened just as millions of former undocumented migrants became eligible to naturalize after receiving permanent residence under the Immigration Reform and Control Act (IRCA) of 1986. Adding to the numbers was a separate policy that exempted family members (spouses, minor children and parents) of U.S. citizens from country quotas as part of a family reunification effort. The authors end the article noting the massive demographic transformation that has resulted from these unintended consequences – a rise in the Hispanic population from 9.6 million to 50.5 million. They offer a counterfactual scenario, in which the Bracero Program was improved, not abolished, and the U.S. stayed out of Central America; the result might have been a smaller illegal population and a less divided country when the terrorists attacked. More might have continued to cross the border legally and for temporary stays, resulting in fewer permanent immigrants, less undocumented migration, and slower population growth. Amazingly – almost despite ourselves—we may actually be headed that way as both illegal and legal entries have fallen while temporary guest worker entry has risen. The next step is for the U.S. to find a way to deal with the remaining legacy of failed policies – undocumented residents who number 11 million. Of those, 3 million entered as children. The authors argue that they should receive amnesty – such as that would have been granted in the Dream Act—while the adults should be able to participate in an earned legalization program. As the Massey/Pren paper shows, a large number of permanent undocumented people is not a good situation for the country—and the next policy solution should aim to solve not create more problems. Article by Douglas S. Massey, the Wilson School’s Henry G. Bryant Professor of Sociology and Public Affairs, and Karen A. Pren, Project Manager, Mexican Migration Project at Princeton’s Office of Population Research, argues that the post-1965 surge in Mexican, Central American, and to a lesser extent South American immigration was not a direct result of policy reforms enacted in the mid-1960s but rather the unintended consequences that unfolded afterward.